It's as true with workout headphones as it is with workout clothes — fit and durability are key. It's as true with workout headphones as it is with workout clothes — fit and durability are key. My favorite pair of sweats are made by Under Armour — the premium materials they use are a cut above your typical gym gear. Same with the waterproof, 100% wire-free Under Armour True Wireless Flash earbuds. 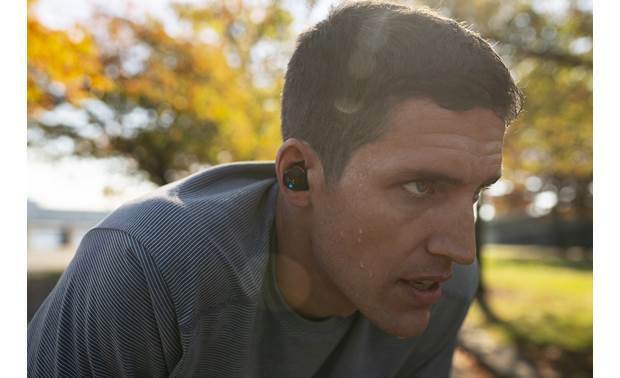 There's no cable connecting the left and right earbud, given you extra freedom while you run and exercise. Soft-grip silicone ear tips and stabilizers help keep the rugged headphones from slipping out or moving around. As for the audio? 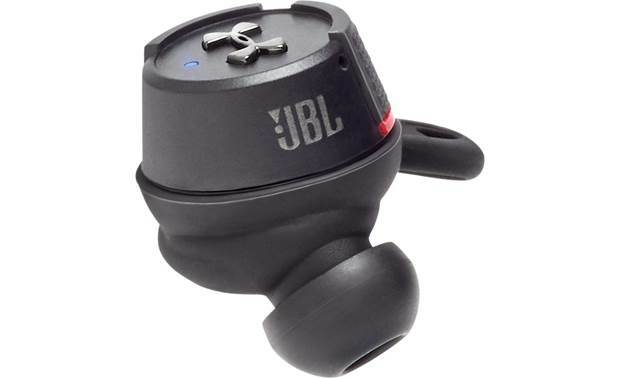 It's covered by JBL, so you get energetic sound with deep, quick-attack bass. 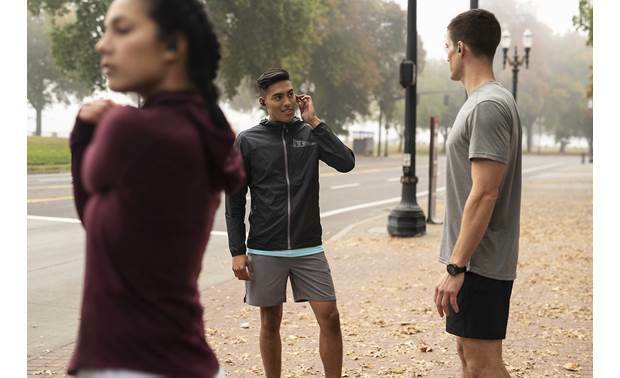 The UA Flash earbuds play music wirelessly via Bluetooth, so you can keep your phone safely tucked away when you're working out in bad weather. You shouldn't have to worry too much about the headphones themselves. 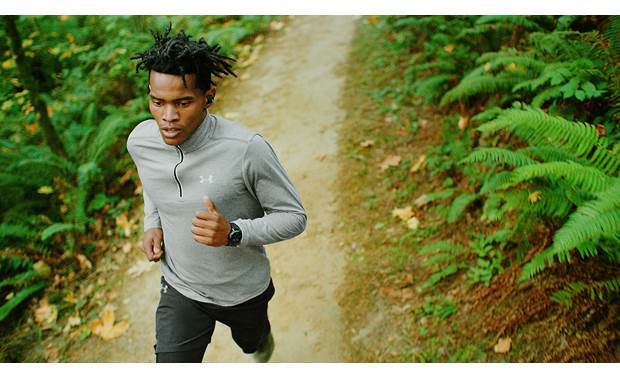 Those durable, high-grade Under Armour materials are all rated full IPX7 waterproof. Three different sizes of ear tips are included, to help you get a secure and comfortable fit. With in-ears like these, a tight seal helps you get the best possible sound, especially when it comes to the bass. 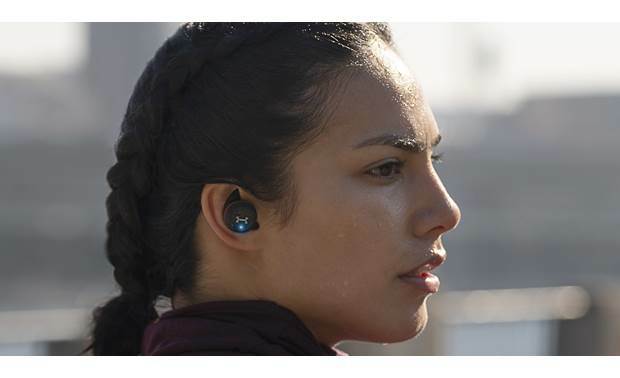 The earbuds can be worn with or without winged attachments, depending on what feels best to you. 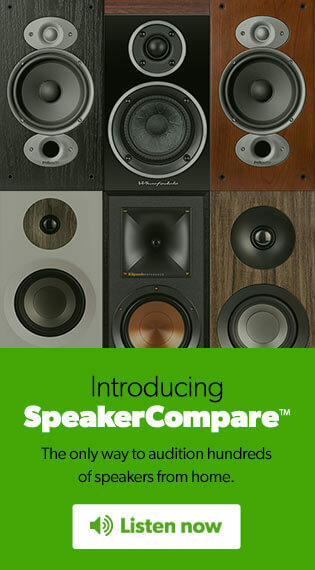 "Ambient" mode lets you hear external sounds mixed in with your music. 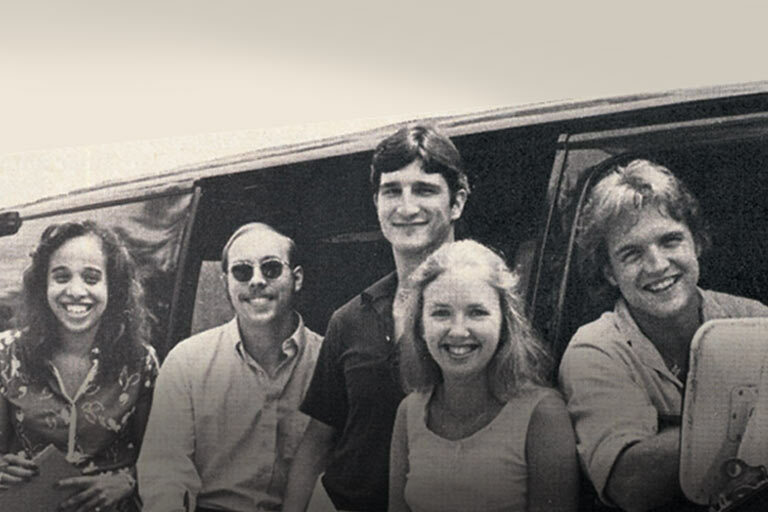 "Talk Thru" mode turns the music off and uses buit-in mics to pick up people's voices. This is helpful when someone tries to strike up a conversation, and you don't necessarily want to take out your earbuds. 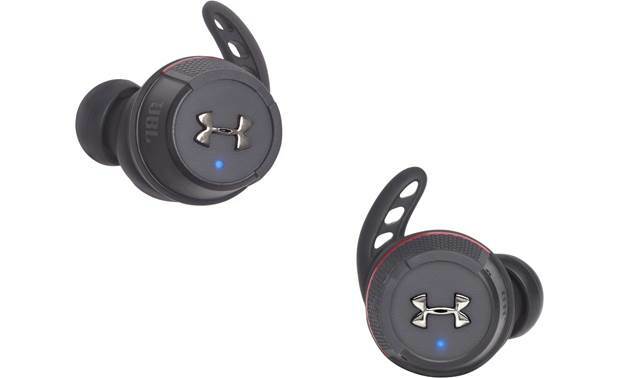 Earcup Width x Height 0.827" x 0.827"
Overview: The Under Armour True Wireless Flash ear buds, engineered by JBL, are wireless in-ear headphones with no connecting cables to hold you back from maximizing your workout. 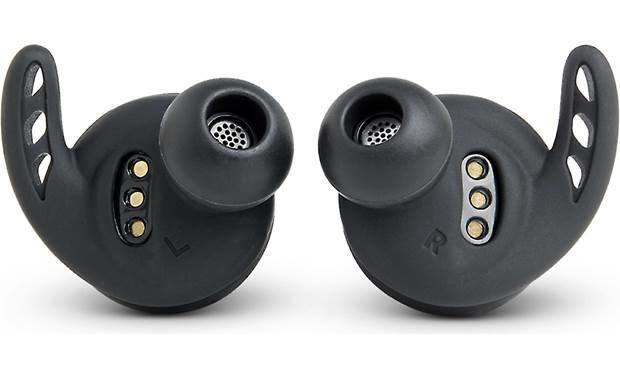 Each individual ear bud has a built-in rechargeable battery, plus touch controls for power, music playback, phone calls, and activating your voice assistant. 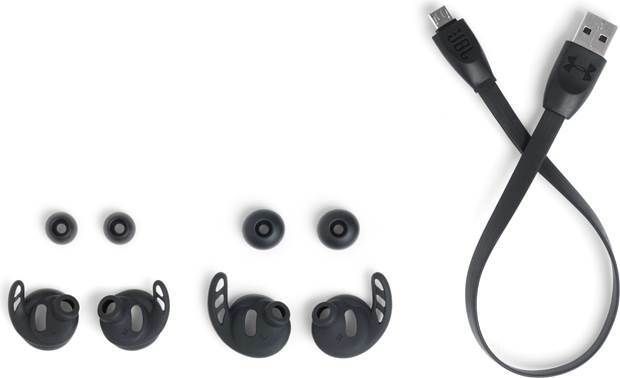 The True Wireless Flash ear buds come with three pairs of silicone Sport Fit ear tips, three pairs of winged Freebit Enhancers, and an aluminum charging case. 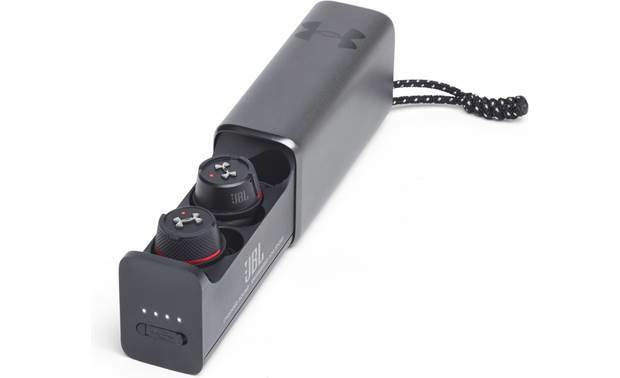 Drivers: The UA True Wireless Flash ear buds are equipped with JBL 5.8mm dynamic drivers that deliver the JBL Signature Sound with a wide frequency range of 20Hz-22kHz. 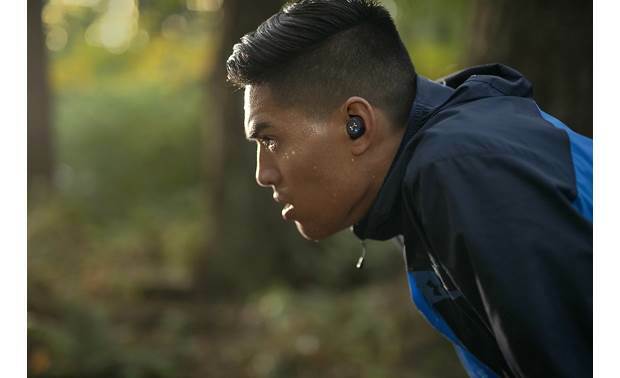 UA Stormproof Waterproof Technology: The UA True Wireless Flash ear buds are IPX7-certified to protect the internal components from water and sweat. This splashproof design keeps them performing in the rain or during a workout. Bluetooth: The ear buds connect to your smartphone or tablet via Bluetooth 4.2 (2.402-2.480 GHz). The ear buds support A2DP (V1.3), AVRCP (V1.5), and HFP (V1.6). Pairing the ear buds to your smartphone or tablet requires touching and holding the left and right ear buds for at least 3 seconds. LED Indicators: Each ear bud has a small LED to indicate the charging and pairing status. In addition, there are four LEDs on the charging case to show the charging status in 25% increments. Microphones: Each ear bud has a built-in microphone for making phone calls, and using your smartphone's built-in voice recognition like Siri and Google Now. 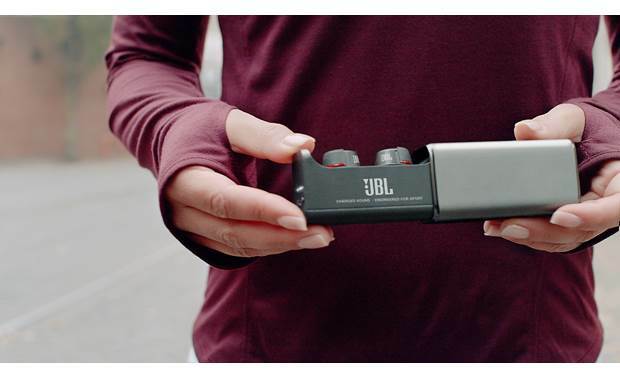 Bionic Hearing: Two JBL Bionic Hearing sound technologies are utilized to help you stay aware of your surroundings as you wear the True Wireless Flash. The TalkThru feature lowers your music while amplifying speech, allowing you to easily hold conversations with others while wearing the ear buds. AmbientAware increases ambient sounds as you listen to your music, helping you to become more aware of your surroundings. This increases safety when walking or running in high traffic areas. Touch Controls: The UA True Wireless Flash features intuitive touch control that lets you pair the ear buds, play/pause, change tracks, take calls, and activate the Siri or Google voice assistant, by simply tapping on the earpiece. Volume must be controlled on the source unit. 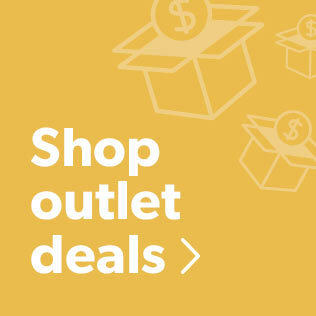 Ear Tips: The ear buds comes with three pairs (S, M, and L) of Sport Flex Fit silicone ear tips, ensuring you get an airtight fit regardless of the shape or size of your ear. In addition, three pairs of ergonomic winged Freebit Enhancers are included to give you a more secure fit during rigorous activities. Rechargeable Batteries: Each of the UA True Wireless Flash ear buds contains a 3.7-volt 110mAh Lithium-Ion rechargeable battery. 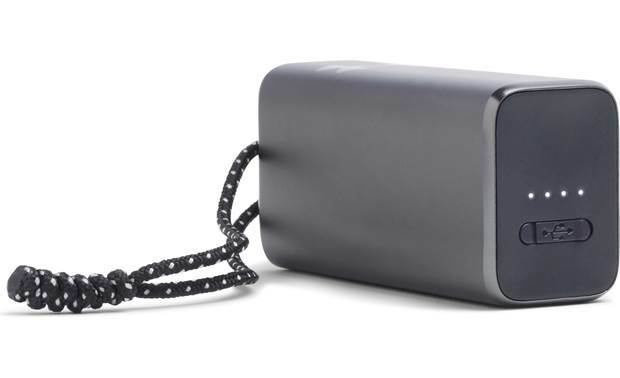 The charging case contains its own 1500mAh rechargeable battery for over 20 hours of total backup charge. Fully charged ear buds provide up to 5 hours playback/talk time, giving you a total of 25 hours of playback/talk time. The ear buds charge in the case in approximately two hours. 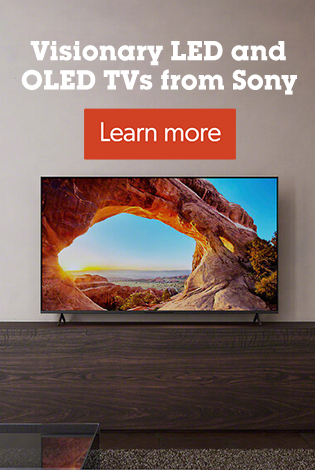 A 15-minute quick charge will give you approximately 1 hour of playback time. The ear buds charge in the provided case with the supplied Micro USB cable. 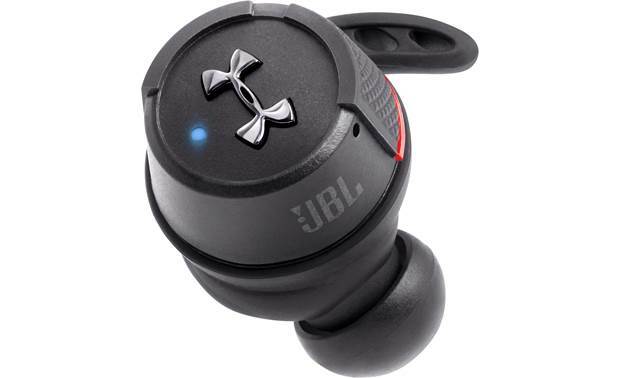 Ear Buds: Diameter 0.827", Depth 0.991"
Case: Width 1.198", Height 1.679" Length 3.377"
Searches related to the Under Armour® True Wireless Flash — Engineered by JBL True wireless sports earbuds with Bluetooth®.